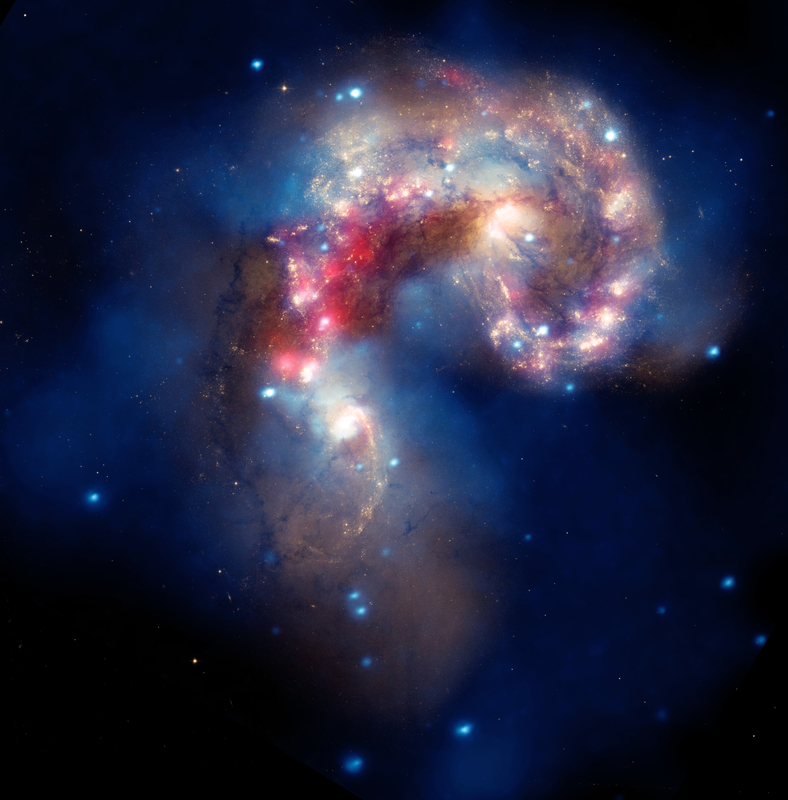 A new composite image from NASA's Great Observatories presents a stunning display of the Antennae galaxies. 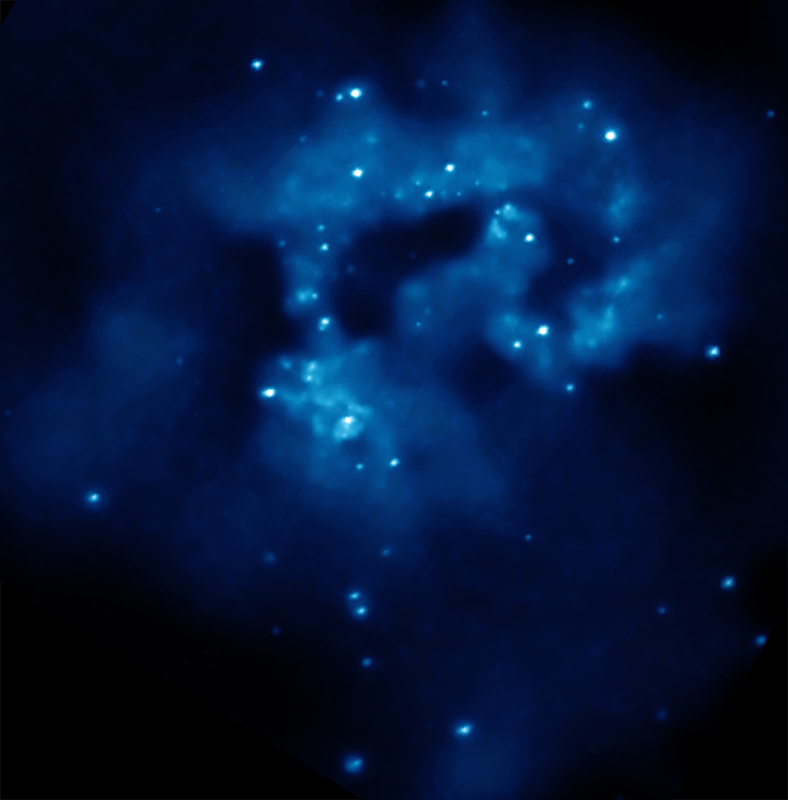 X-ray data from Chandra (blue), optical data from Hubble (gold and brown), and infrared data from Spitzer (red) are featured. A beautiful new image of two colliding galaxies has been released by NASA's Great Observatories. The Antennae galaxies, located about 62 million light years from Earth, are shown in this composite image from the Chandra X-ray Observatory (blue), the Hubble Space Telescope (gold and brown), and the Spitzer Space Telescope (red). The Antennae galaxies take their name from the long antenna-like "arms," seen in wide-angle views of the system. These features were produced by tidal forces generated in the collision. The X-ray image from Chandra shows huge clouds of hot, interstellar gas that have been injected with rich deposits of elements from supernova explosions. This enriched gas, which includes elements such as oxygen, iron, magnesium and silicon, will be incorporated into new generations of stars and planets. The bright, point-like sources in the image are produced by material falling onto black holes and neutron stars that are remnants of the massive stars. Some of these black holes may have masses that are almost one hundred times that of the Sun. The Spitzer data show infrared light from warm dust clouds that have been heated by newborn stars, with the brightest clouds lying in the overlap region between the two galaxies. The Hubble data reveal old stars and star-forming regions in gold and white while filaments of dust appear in brown. Many of the fainter objects in the optical image are clusters containing thousands of stars. 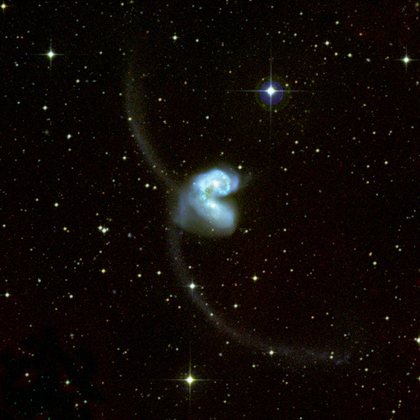 Scale Image is 3.4 arcmin across, (about 61,000 light years). Coordinates (J2000) RA 12h 01m 53.70s | Dec -18° 52´ 35.5"
Can one establish an age by determining the age of the stars at various physical points along the merger making use of the shock induced star formation in the regions along merger? It is really a mystically profound experience for me to view this presentation on the collision of galaxies. It took less than a million years for human intelligence to evolve to such a level to be able to comprehend the universe in which he is an astronomically insignificant entity, yet the glorious development of man's knowledge to be able to reach this level awareness is more than a miracle. Thanks to USA NASA for its contribution to this human development. I would suggest that you do a search in your favorite search engine and type in merging galaxies or galaxy collisions etc. I have found many great photos of galaxy mergers this way. Is there an image of a galaxy merger in a more advanced state? I would love to see that. Too great. Thank you all team members. I have seen colliding galaxies for the first time. It is difficult to compare such time spans with our life spans. Thanks for your comment. We agree that the image does resemble an embryo, which is apt in the sense that the merger will slowly develop into a new galaxy. The collision did start a long time ago, but it won't have an impact on our galaxy, if that's what you mean. Finding the source of cosmic rays is an active area of research. Supernova explosions and rapidly growing supermassive black holes are two of the leading culprits that have been discussed, so there is some overlap with your thoughts. years, though this number isn't known very precisely. One Of the most BEAUTIFUL image i have ever seen. Its spectacular, breath taking and glorious. Spectacular. Keep the images coming please. Is there a print of this for sale anywhere. How long has this merger been going on? That's a wonderful observation, amazing. As one observes our universe, one must think of the possible source of Cosmic Rays. I suggest that Cosmic Rays originate in other universes and are happy wanderers. It is as if galactic spin eventually becomes the Black Holes with energy ejected from the center becoming those Cosmic Rays. So now we know how Cosmic Rays become possible and what they are. So, in laymen's terms, could we say that this collision started to happen a long time ago and may or may not have an impact on our system as it further develops? Amazing observation of galaxies, as if a dolphin diving back into sea. Absolutely amazing. I wish to know if we have detected any GRBs from this galaxy. A pair of colliding galaxies. About 62 million light years from Earth. By combining images from NASA's three Great Observatories. About 61,000 light years across. In the constellation Corvus (crow), visible in the Southern Hemisphere and very low on the southern horizon in the Northern Hemisphere.